Professional window cleaning kit includes the tools you need for professional window cleaning. Ergonomically designed washers, squeegees and scrapers fit securely on the extension pole for efficient, safe cleaning. 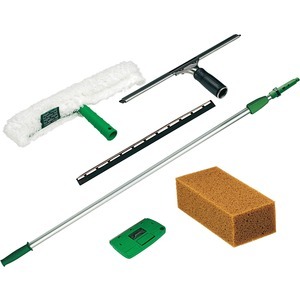 Kit includes 8' OptiLoc 2-section Tele-Pole, 18" Original StripWashers Strip Pac, Pro Stainless Steel Squeegee Handle, 14" S Channel with ErgoTec Soft Rubber, 18" S Channel with ErgoTec Soft Rubber, ProTrim10 Scraper and large sponge. Strip Pac is a standard washer sleeve with plush, woven, synthetic fabric on the front, and a textured pad strip on the back has hook-and-loop fastening. Rough-textured, nonabrasive nylon cleaning pad removes tough dirt. The squeegee handle includes a nonslip rubber grip ideal for all weather conditions and a fast lock for quick channel changes. The stainless steel channels feature a notched channel system that will not slip, wobble or bend. The stainless steel construction is strong, long-lasting and rust-free.